This hotel is across the street from the beach, about 1 mile from Galveston's Strand Historic District and 2 miles from Moody Gardens. 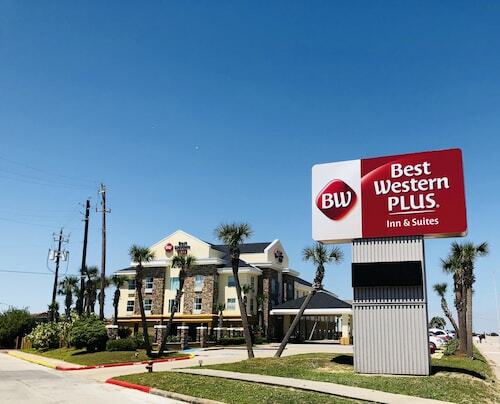 Located in West End, this motel is within a 15-minute walk of 61st Street Fishing Pier and Galveston Island Convention Center. Moody Gardens and Galveston Schlitterbahn Waterpark are also within 3 mi (5 km). 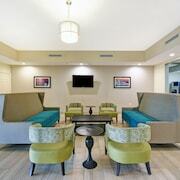 Centrally located on Galveston Seawall Boulevard, this ten-story hotel is adjacent to Galveston Convention Center. The beach is just across the street. 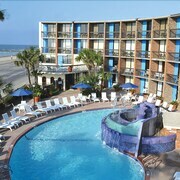 Four Points by Sheraton Galveston places guests steps from both the beach and Galveston Island Historic Pleasure Pier. It's a 5-minute drive to Strand Historic District, and 15 minutes to the 19th-century tall ship at the Texas Seaport Museum. 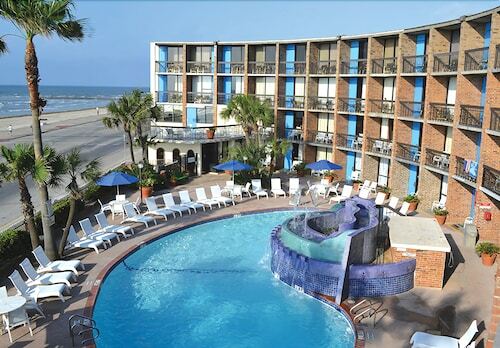 Nestled on the beach, this Galveston hotel is within a 5-minute walk of East End Historic District and Galveston Island Convention Center. Moody Gardens and Galveston Schlitterbahn Waterpark are also within 3 mi (5 km). 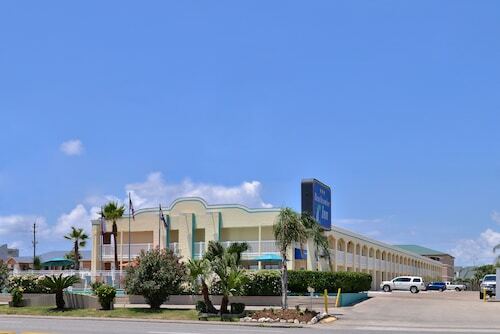 Situated in Galveston, this beach hotel is within 3 mi (5 km) of Galveston Schlitterbahn Waterpark, Moody Gardens, and Galveston Island Historic Pleasure Pier. Bishop's Palace and Grand 1894 Opera House are also within 6 mi (10 km). 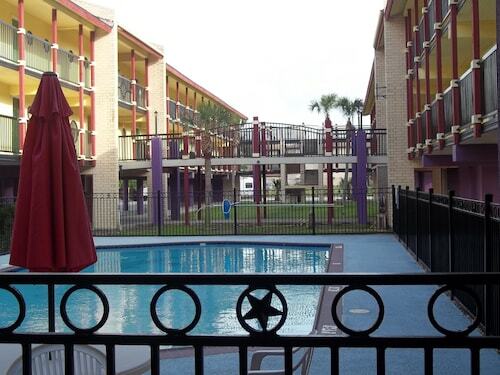 Situated near the airport, this hotel is within a 10-minute walk of East End Historic District and Galveston Island Historic Pleasure Pier. Galveston Seawall and Port of Galveston (Galveston Wharves) are also within 2 mi (3 km). 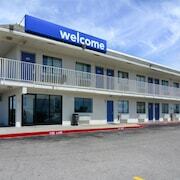 Located in West End, this hotel is within 1 mi (2 km) of Magic Carpet Golf and Galveston Fishing Pier. Galveston Schlitterbahn Waterpark and Moody Gardens are also within 2 mi (3 km). There is an island destination that was once known as the “Playground of the South,” a place that enchants all of the senses with delicious food, beautiful beaches, and days that stretch before you with endless possibilities. In Galveston, Texas, the roar of rollercoasters and the irresistible smell of popcorn delight children on the boardwalk; romantic waterfront dinners inspire love and romance; and activities from kayaking to scuba diving ensure you’ll fall into a deep slumber at the end of each day. Discover the best things to do with our convenient guide, then explore Galveston beachfront hotels right here on Travelocity. 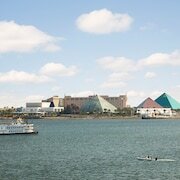 Can I go scuba diving during my trip to Galveston? Yes! In fact, the Texas coast of the Gulf of Mexico is both a renowned and little-known scuba diving destination. Amongst the pros, it’s a well-kept secret that the Texas Coastal Bend has it all: majestic shipwrecks, protected marine sanctuaries and plenty of sea life. And while you won’t find most of these things right out front of Galveston beach hotels, you can easily board a charter to the fun. Flower Garden Banks: Seventy miles off the Galveston shore, this coral reef system is just as colorful as it sounds. Get up close with corals the size of small automobiles and befriend the gentle giant of the oceans, whale sharks. Offshore oil rigs: Closer to home, explore the surprising marine life that pops up around the oil rigs right off the shore—angel fish, barracuda, giant groupers, dolphins and whale sharks, just to name a few. Twin Lakes Scuba Park: For a fresh adventure, head 40 miles inland and dive to the boat wrecks haunting the depths here. Where can I find the best seafood in Galveston? One thing is for certain: You’re never far from great seafood in Galveston. The catch of the day is always fresh and always local—American red snapper, Gulf red grouper, shrimp, oysters, and blue crabs are just the beginning. The Texas Coastal Bend truly enjoys the bounty of the sea, and you can count on Galveston restaurants to serve it up fresh. Galvez Bar & Grill: The specialty in the restaurant at the Hotel Galvez & Spa, A Wyndham Grand Hotel is the house campechana (Mexican seafood cocktails), plus the fresh catch of the day. Grilled, broiled, or blackened? The choice is yours. Olympia Grill at Pier 21: This establishment won "Best Waterfront Dining" in the 2015 Best of Galveston Awards. 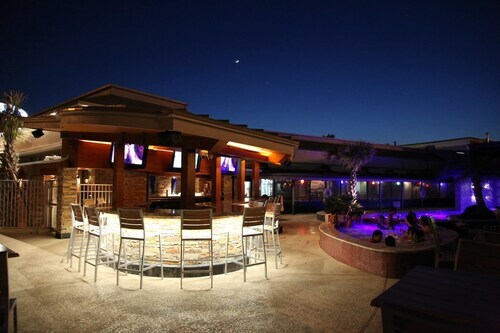 See for yourself what’s so impressive about this harborside spot. Black Pearl: Have eyes only for oysters? Follow the locals to neighborhood haunt and prepare to swirl and slurp to your heart’s content. Katie’s Seafood Market: Find your perfect fish and create your own feast. With apartment hotels like Seascape Deluxe Beach Condos by AB Sea Rentals, the best seafood just may be in your very own kitchen. 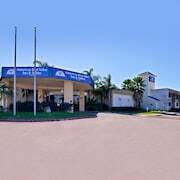 In a place that seems to be directly based on paradise, you know that you want your accommodation to be just as charming and alluring as the scenery outside. Book one of Travelocity’s Galveston hotels on the beach, and you can rest easy each night, with the ocean at your door and dreams of the next day’s fun and games in your head. In the heart of historic downtown Galveston. Walking distance to many things. The pool isn’t heated. I was there for 4-days and never put on my swim suit. Water is too cold. Other then that, it was a great stay. I will be back. Very nice room. Nice size tv and lots of channels. Breakfast was good. Room floor was extremely slick. No mat or rails in or on the bath tub. I loved the observation deck and how easily accessible it is to the beach and nearby attractions.